The Rheem 3 phase RKKL Package Gas/Electric units feature earth-friendly R-410A refrigerant. This platform provides you with a full line of capacities that are each AHRI-certified. 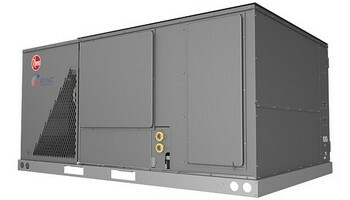 The design is certified by CSA International.All of our residential/commercial package units, regardless of efficiency level, feature the Scroll Compressor. The scroll compressor uses a more advanced technology than traditional reciprocating compressors. Scroll compressors with internal line break overload and high pressure protection. Single stage compressor on 7.5 & 10 ton models. Two stage compressor on 12.5 ton models. Molded compressor plugs. They have fewer moving parts, and they are quieter, more efficient, and longer lasting.Our cabinets have a powder painted finish that protects them from the harshest weather extremes. And our louvered condenser compartment is the best in the industry for protecting the condenser coil against yard hazards and weather extremes. There is a one-piece top cover and one piece base pan with drawn supply and return opening for superior water management.Foil faced insulation encapsulated throughout entire unit minimizes airborne fibers from the air stream. Access door with heavy-duty gasketing, and mechanically attached with 5/16" screws. Slide Out Indoor fan assembly for added service convenience.Our motor mount helps protect the fan motor from the elements for longer life. Its design dependability helps reduce vibration and noise. High performance belt drive motor with variable pitch pulleys and quick adjust belt system. Permanently lubricated evaporator, condenser and gas heat inducer motors. Condenser motors are internally protected, totally enclosed with shaft down design.Control box operational controls are “up front” for quick access and service diagnostics. The draft inducer motor is specially designed to quietly provide combustion air while simultaneously venting outdoors the combustion products from the furnace heat exchanger. In addition to the draft inducer motor, the in-shot gas burners, gas valve and manifold efficiently regulate the flow of gas for combustion. These new gas/electric units also feature direct-spark ignition and remote flame sensors for added dependability and efficiency,The blower is responsible for the flow of air into your duct work. Micro Channel Outdoor Coils and other system components for maximum efficiency and quiet operation. Single slab, single pass designed evaporator coil facilitate easy cleaning for maintained high efficiencies. Internally sloped slide out condensate pan conforms to ASHRAE 62 standards.Our new package gas electric units feature a tubular heat exchanger design. Tubular heat exchangers are more efficient and durable than older-style clam shell heat exchangers.